Hanoi borders on Thai Nguyen to the north, Ha Tay to the south, Bac Ninh and Hung Yen to the east and southeast, and Ha Tay to the west. Urban Districts: Bac Tu Liem District, Cau Giay District, Dong Da District, Ha Dong District, Hoang Mai District, Long Bien District, Nam Tu Liem District, Tay Ho District, Thanh Xuan District. Rural district :Ba Vi District, Chuong My District, Dan Phuong District, Dong Anh District, Gia Lam District, Hoai Duc District, Me Linh District, My Duc District, Phu Xuyen District, Phuc Tho District, Quoc Oai District, Soc Son District, Thach That District, Thanh Oai District, Thanh Tri District, Thuong Tin District, Ung Hoa District. Climate: Hanoi is situated in a tropical monsoon zone. So the average annual temperature is 23,20C. The average temperature in winter is 17.20C, but it may goes down to 50C. The average temperature in summer is 29.20C, but it can reach up to 400C. Temple & pagoda: There are the typical temples that you should visit such as Van Mieu Quoc Tu Giam which is the first university in Viet Nam; Quan Thanh Temple was built during the reign of Emperor Ly Thai To (1010-1028); Ngoc Son Temple was built on Ngoc (Jade) Island of Hoan Kiem Lake. And there are some important architectural pagodas that you may concern such as Tran Quoc Pagoda which is the oldest pagoda in Vietnam; One Pillar Pagoda with its unique architecture. Historical destinations: there is Ba Dinh Square and Ho Chi Minh Museum and President Ho Chi Minh’s stilt house are located in the area near by. 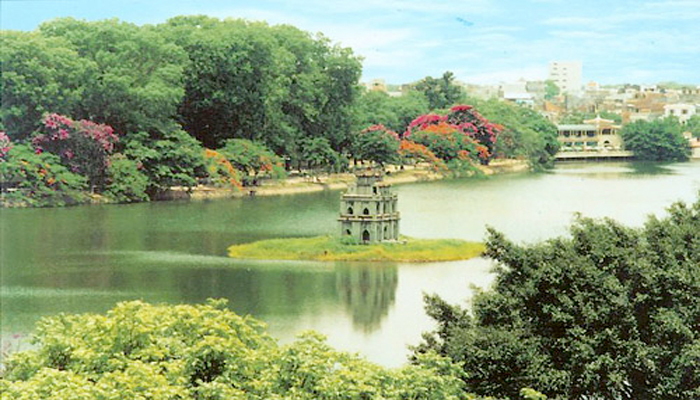 Some lakes famous in Ha Noi: they are Hoan Kiem Lake that constitutes the core of Hanoi; Truc Bach Lake which is separated from West Lake by Thanh Nien road and West Lake with the great natural picture. Other destinations that you must visit: Old Quarter located north of Hoan Kiem Lake; Dong Xuan Market which is the biggest market in Hanoi and it was founded in 1889 in the Dong Xuan Quarter and Vietnam Museum of Ethnology which is located in Cau Giay District. Co Loa Festival: is from 6th-16th of the 1st lunar month. Co Loa Festival takes place every year at An Duong Vuong Temple in Dong Anh District, on the outskirts of Hanoi. Co Loa Festival commemorates Thuc Phan An Duong Vuong, the man to whom the 18th Hung Vuong King gave his throne. Soc Son Temple Festival: is on 7th of 1st lunar month. Soc Son Temple is located in Ve Linh Hamlet in Soc Son District, on the outskirts of Hanoi. The temple is devoted to the cult of Saint Giong, a hero who fought against foreign aggressors during a resistance war. The festival includes incense cleansing ritual, a bamboo flower procession and a betel procession. There are many things in the city that you can try such as Phở Hà Nội (Ha Noi noodle soup), Chả Cá Lã Vọng (La Vong fried fish), Bánh cuốn Thanh Trì (Thanh Tri steamed rolled rice pancake), Bánh Tôm Hồ Tây (Ho Tay crisp shrimp pastry), Cốm gói lá sen (untimely rice wrapped lotus leaf), ô mai (salted or sugared dry apricot) and etc.